(CNN) - Sen. Charles Grassley is standing by his earlier comments suggesting some embattled AIG executives should "resign or commit suicide," but told CNN Tuesday he was merely speaking rhetorically. "Of course I don't want people to commit suicide," the Iowa Republican said. "But I do want an attitude in corporate American that's similar to what they have in corporate Japan. "[In Japan], people that run a corporation into a ground have violated their trust with the stockholders and maybe even the taxpayers - they take a very deep bow, they apologize, they are remorseful, they are contrite, they take full responsibility," he added. "We have not heard the sort of apology, remorsefulness, contrition, that we ought to hear from corporate executives in America assuming full responsibility." Grassley's initial comments came Monday afternoon during an interview with Iowa radio station WMT. During the interview, Grassley endorsed what he viewed as Japan's corporate model, saying it is customary for failed executives to either relinquish their posts or commit suicide in disgrace. "In the case of the Japanese, they usually commit suicide before they make any apology," he said during that interview. 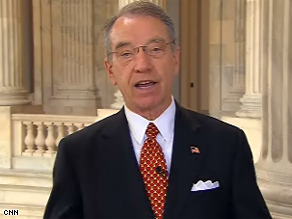 A spokesman for AIG called Grassley's initial comments "very disappointing." We have the same Japanese ideology in corporations all across America. Except here, the employees are expected to abide by Japanese teamwork ideology by learning new Japanese teamwork buzzwords, giving up their breaks, and working for less pay, while their CEOs and executives get perks which should have gone to creating new jobs or improving conditions. I agree with his comment. This goes straight through our entire society right now. It is ok to fail! We love failures. Just like the basketball team that got the score ran up on them. I agree that was bad but for them to get tickets to Mavs games and to get all kinds of special treatment because they lost, to me is just wrong. So these executives need to get punished instead of praised for their poor performance. I say get rid of the bonuses. I know I have heard the arguement that we need these bonuses to keep qualified people here. Well I bet if it is between loosing your job or getting a bonus i would keep my job. Also there are plenty of people out of work right now and I am sure they all would love to have a chance at running AIG. They couldn't do any worse, and they would be thankful to have a job. just close aig's doors, that will be sufficient. Democrat or Republican, it's refreshing to see any politician throw any sense of caution into the wind and comment with a no nonsense statement such as this. An honest comment based on his personal opinion that doesn't leave much for “political interpretation”. Rhetorically speaking - there are PLENTY of legisalators in Washington DC who also need to "commit suicide." They are on both sides of the aisle and they have completely violated our trust over the past 25 years! He only said what we're all thinking. I haven't heard a Republican make this much sense in a long time. Anyone who would take that money in the present economic situation is a rat. Wasn't there a study done couple of years ago that incompetent people don't know they're incompetent? Probably true, until they wreck the economy. Of course this gang is worse than incompetent. Maybe now it will dawn on them that they, along with politicians, have brought the world economy to its knees. I'm tired of people making stupid decisions and expecting the rest of us to pay for them. Taking all we can get is the mentality this country has been feed for a few generations. One generation becomes greedier than the next. Corporate mentality: we must make more money this year than last. It gets to the point that you can only make so much. Hopefully, if one good thing comes from the repression, America starts to realize that every mountain has a downside. The bonus recipients will not give back the money. They will not feel remorse for keeping it. This is our every man for themselves attitude. Reagan propagated the mind set by telling us that Carter has no right to tell us to cut back on our spending. It has been downhill in this country since. I'm glad he said it – and sorry he later admitted it was rhetorical. There was nothing rhetorical about the suicides of Main Street citizens spurred by the failing economy. I also want to know why Martha Stewart served prison time for investment advice from a friend while all these corporate heads who have have misappropriated billions and collected taxpayer funded bonuses are laughing all the way to their off shore accounts. The sad thing the Dems. will give them more money with no oversight.